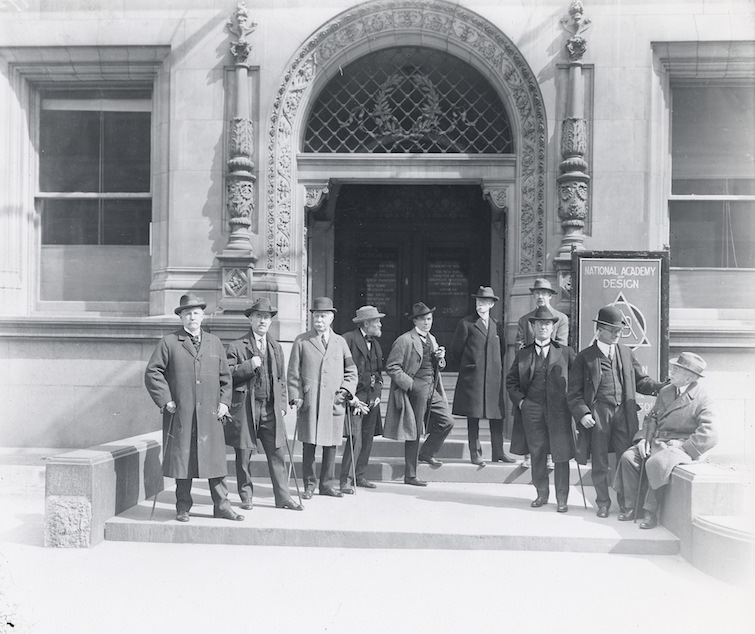 A selected chronology of the Art Students League’s West 57th Street home since 1892. 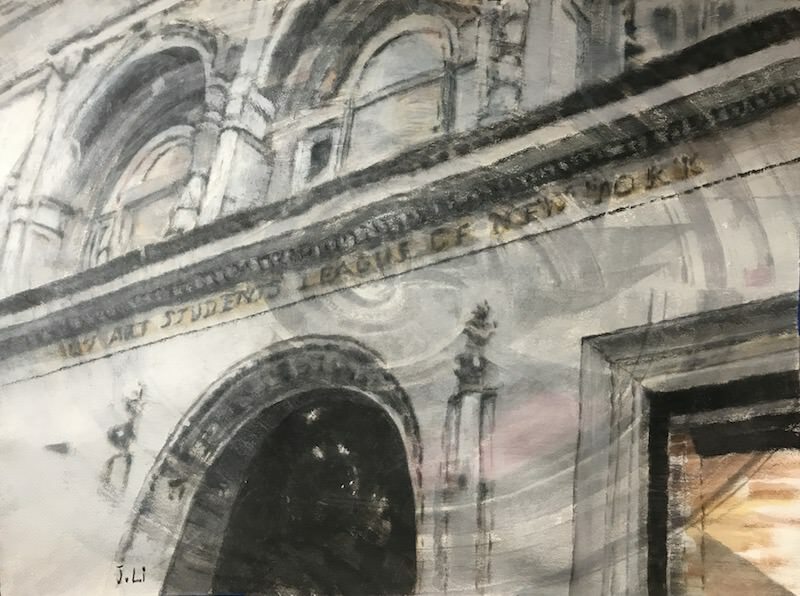 Over the last 125 years, the Art Students League of New York (ASL) has become synonymous with its building, the American Fine Arts Society (AFAS). 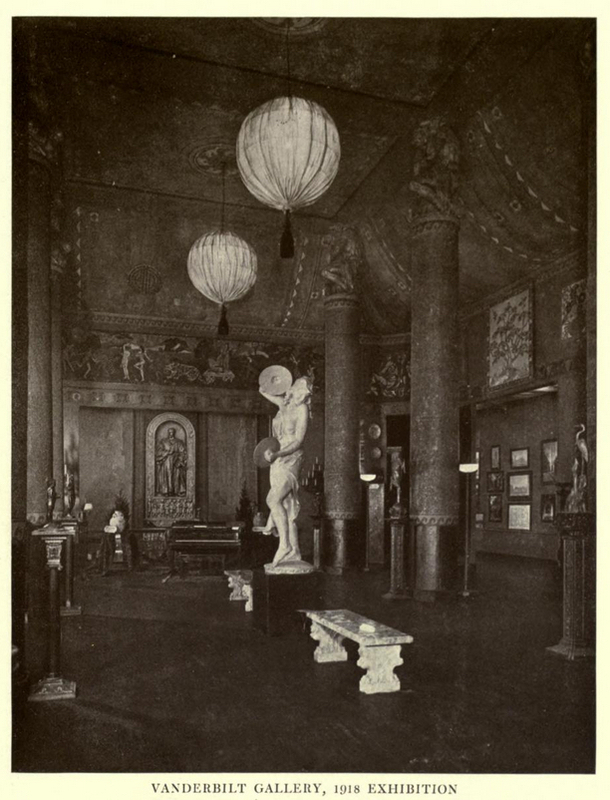 But in 1892, when the AFAS first opened, the ASL was just one constituent of the building, which it shared with the Society of American Artists and the Architectural League of New York. It was not until 1941, when the ASL bought out the stock from the National Academy of Design and the Architectural League of New York, that it became the sole shareholder. The AFAS has its own complex history as a stockholding corporation; an artists’ cooperative; a collection of north-lit teaching studios; a series of sky-lit galleries designed for loan exhibitions; a limestone facade that pays homage to the French Renaissance, and a piece of Fifty-seventh Street’s illustrious history. Presented here is an overview of some of the people and events that have transformed this New York City landmark. To honor this anniversary, the Art Students League presents A Landmark Exhibition: Artists and Patrons on West 57th Street on view in the Phyllis Harriman Mason Gallery, November 7–December 4, 2017. 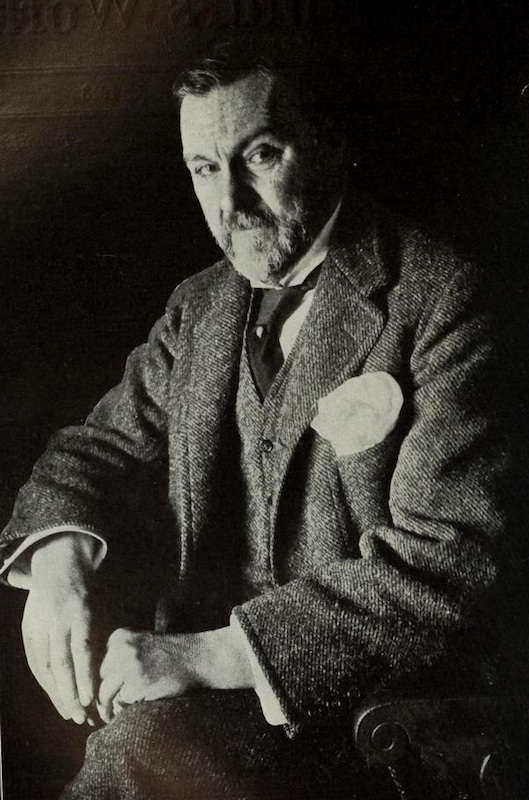 Architect Henry Janeway Hardenbergh, c. 1906. Howard Russell Butler, a Columbia-trained lawyer and painter, proposes a cooperative building to house young, cash-poor art societies. His project, the American Fine Art Society, joins the Art Students League of New York, the Society of American Artists, and the Architectural League of New York, as equal shareholders in a stock corporation, which is overseen by a separate AFAS board. The AFAS is incorporated on June 10. On May 3, the AFAS board purchases six adjacent lots on a block between Seventh Avenue and Broadway for $154,000. With 75 foot frontage on West 57th Street, the lot extends just over 200 feet through to 58th Street. In an effort to raise capital quickly, Henry G. Marquand, president of the board of trustees of the Metropolitan Museum of Art, purchases shares on behalf of the ASL, which he offers for sale to its individual members. A competition to design a building for the AFAS attracts thirty-nine entries. The committee selects Henry Janeway Hardenbergh’s plans, which are publicly unveiled at the Architectural League of New York’s Seventh Annual Exhibition at the Fifth Avenue Art Galleries. John Singer Sargent, Henry G. Marquand, 1897, oil on canvas, 52 x 41 ¾ in. 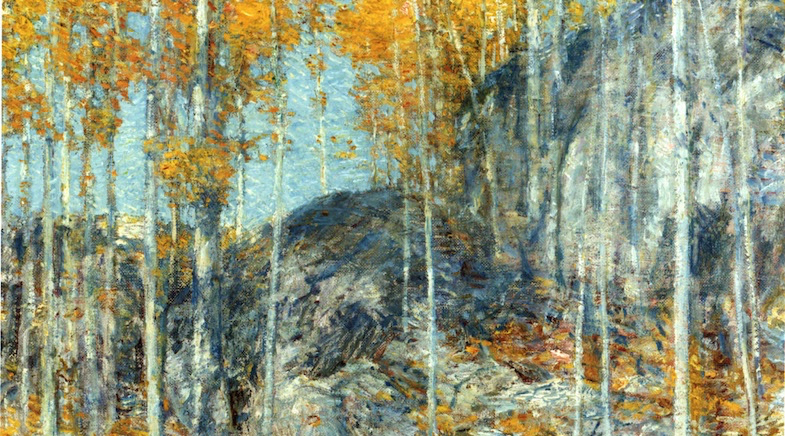 The Metropolitan Museum of Art, Gift of the Trustees, 1897. 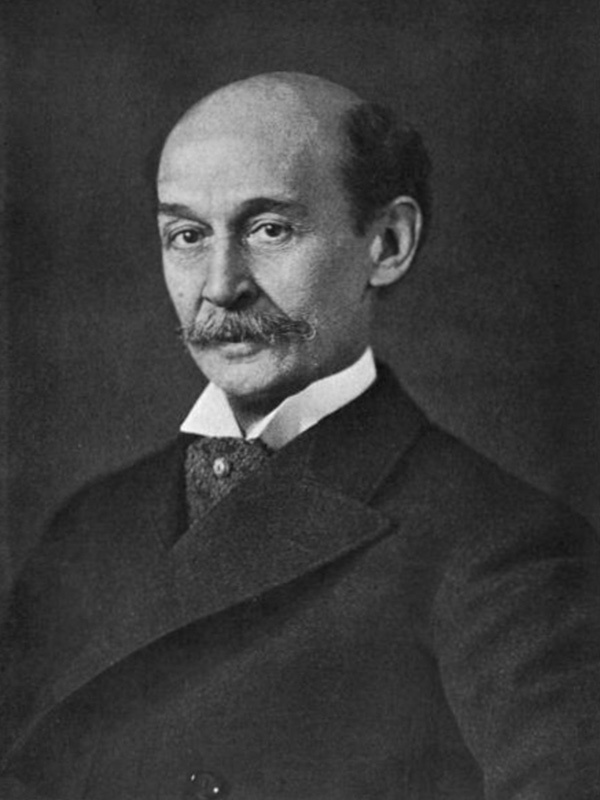 To help finance construction, George Washington Vanderbilt II, an art collector, agrees to loan the AFAS $100,000 in exchange for a portion of lot, 75 x 58 ft., along 58th Street, on which he erects the Vanderbilt Gallery, a spectacular public gallery, modeled on the George Petit Galerie in Paris, with forty-foot, sky-lit ceilings. The AFAS agrees to pay back the loan within two years. On February 8, a cornerstone dinner is held at Andrew Carnegie’s Music Hall, where artists and patrons toast the project alongside New York City luminaries in education, letters, law, and publishing. A formal opening reception for the AFAS is held on December 3 with nearly 3,000 in attendance. Two simultaneous inaugural exhibitions are featured in its galleries: Prints from the Collection of George Washington Vanderbilt and the Retrospective Exhibition of the Society of American Artists. 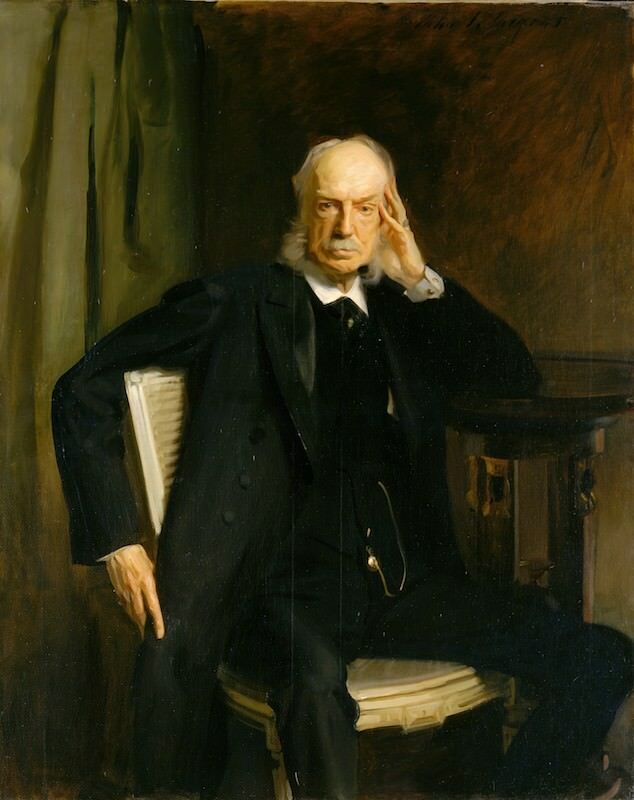 On December 31, George Washington Vanderbilt II donates the Vanderbilt Gallery and the deed to the land to the AFAS, in effect, forgiving the loan. 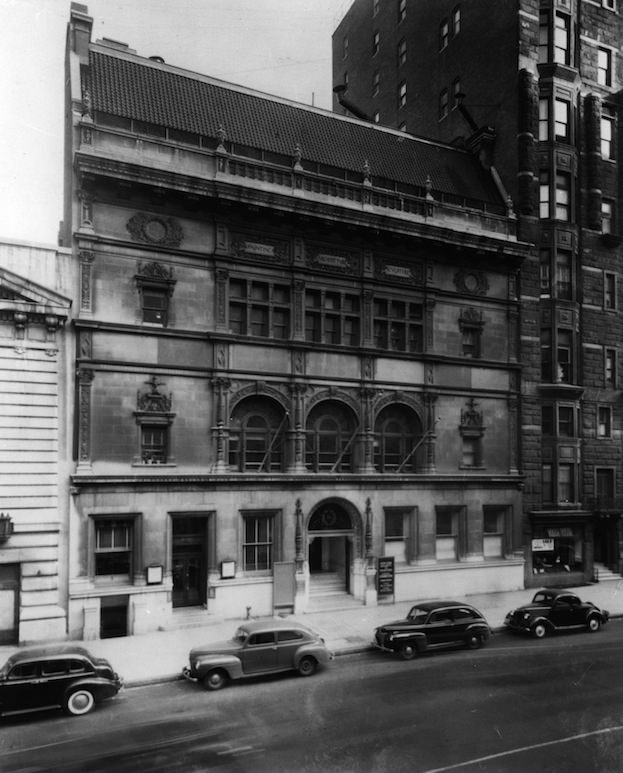 Carnegie Hall, the first cultural anchor of West 57th Street, opened with a five-day music festival in May 1891. 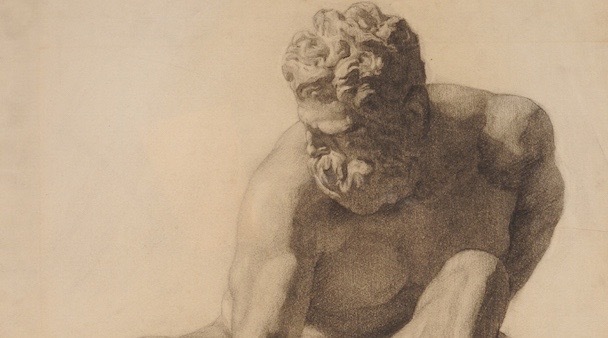 Two loan exhibitions in the AFAS galleries, Bronzes by Antoine-Louis Barye and Old Dutch and Flemish Masters from the Collection of Louis B. Ehrich, attract 28,000 visitors. Andrew Carnegie gives the AFAS a bronze reproduction of Seated Hermes, one of the most celebrated Roman works discovered in 1758 at the Villa dei Papiri at Herculaneum. 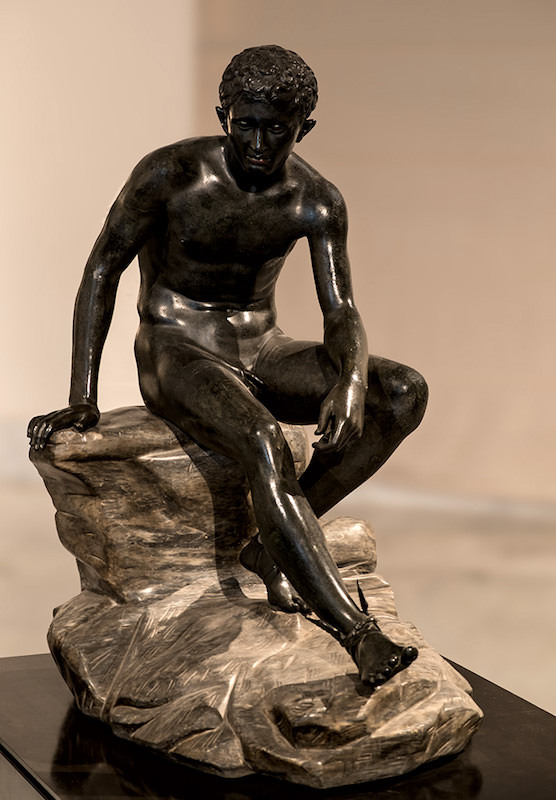 The original work that served as the basis for Carnegie’s gift: Sitting Hermes. Bronze. Naples, National Archaeological Museum, Herculaneum, Villa of the Papyri, 1758. © 2012. Photo: I. Sh. A peak year for loan exhibitions in the building, the AFAS calendar included: Pictures Contributed by Sweden, Norway, and Holland of the World’s Columbian Exhibition; the Theodore Graf Collection of Ancient Greek Portraits; a memorial exhibition of the paintings of George Inness; the Herter Collection of Japanese Color Prints and Paintings; and Paintings of Japanese Scenery in conjunction with Hellenic-Egyptian Portraits from the Tombs of the Fayum. Though allocated over 10,000 square feet in the building, the ASL must rent supplemental studio spaces outside the building to accommodate its classes. The AFAS receives tax exemption by New York State. One of the 447 prints exhibited in The Masters of Ukioye, loaned by collector Howard Mansfield, who later served as the Metropolitan Museum’s first acting curator of Asian art. 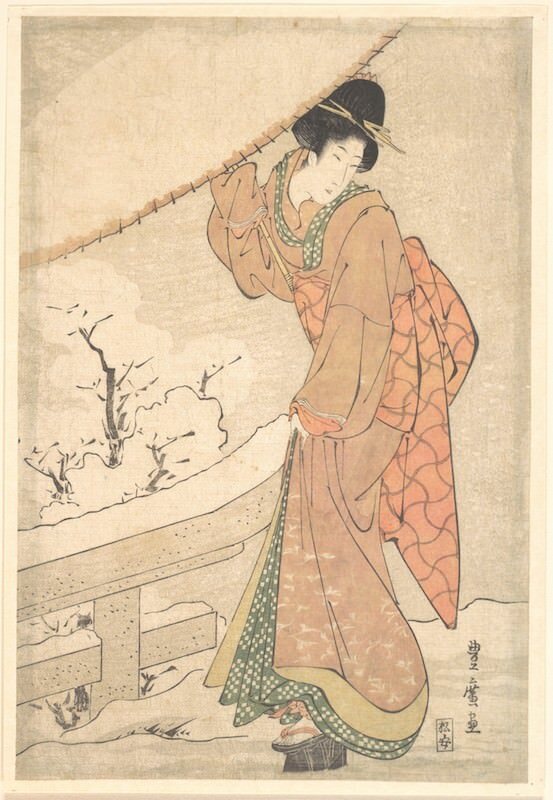 Utagawa Toyohiro, A Young Woman in a Snow Storm Carrying a Heavily Snow-Laden Umbrella, ca. 1802, Probably one sheet of a triptych of polychrome woodblock prints; ink and color on paper, 12 3/8 x 8 3/8 in. The Metropolitan Museum of Art, The Howard Mansfield Collection, Purchase, Rogers Fund, 1936. The West Side YMCA building opens at 318 West 57th Street, which includes a dormitory where painter George Bellows first lived while studying at the New York School of Art with Robert Henri. The AFAS galleries host The Masters of Ukioye, the first complete historical survey of Japanese paintings and color prints, spanning 1630 to 1850, which “depict activities and scenes from the entertainment district of Edo.” The exhibition was accompanied by a descriptive catalogue written by Ernest Fenollosa, curator of Oriental art at the Museum of Fine Arts, Boston. Instructor William Merritt Chase leaves the ASL to open the New York School of Art in rooms at 57 West 57th Street, where he continues teaching until his return to ASL in 1907. On May 3 a fire caused by decorations hung for a Society of American Fakirs costume dance on the building’s fourth floor destroys its roof. Over the summer while repairs are made, the ASL’s classes are moved to the South Gallery on the first floor. Taber Sears uses the Vanderbilt Gallery to paint a mural-sized oval canvas New York Received by Europe at the Eastern Gateway of the Americas for the Alderman’s Chamber at City Hall. 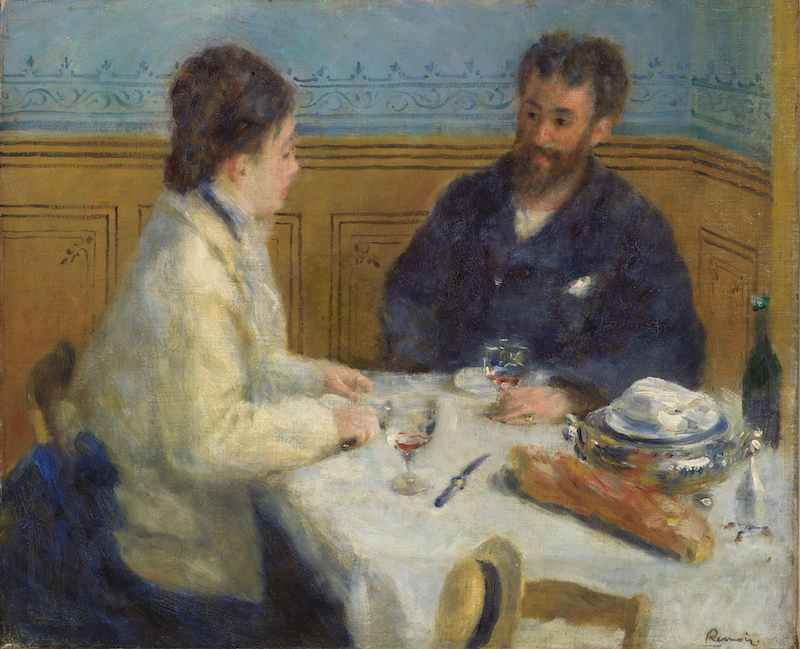 Pierre-Auguste Renoir’s Luncheon (Le Déjeuner) of 1875 was loaned by art dealer M. Durand-Ruel for the Comparative Exhibition of Native and Foreign Art. The painting is now part of the Barnes Collection. Howard Russell Butler resigns as president of the AFAS board. 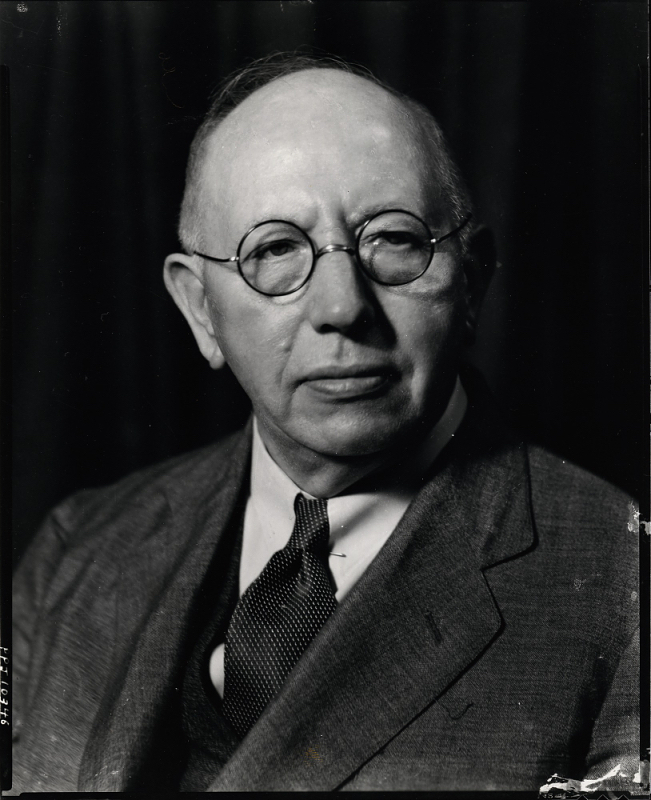 William Bailey Faxon, the board’s treasurer, succeeds him and continues as president through 1921. The National Academy of Design moves into the first-floor offices of the Society of American Artists and assumes their shares in the building when the two organizations merge. The East, West, and Central galleries combine into a single large “Second Gallery,” that is situated between the Vanderbilt and South galleries. A new studio building, designed by architects Pollard & Steinam, is completed at 130 West 57th Street, an addition to three nearby buildings catering to artists: the Sherwood Studios at 58 West 57th Street (1880); the Rembrandt at 152 West 57th Street (1881); and the Holbein Studios at 139–151 and 146–152 West 55th (1888). The Fine Arts Federation holds a memorial for artist John White Alexander in the Vanderbilt Gallery. A high-relief portrait of Alexander in bronze by Herman Atkins MacNeil is placed temporarily in the NAD’s office and later permanently installed in the AFAS lobby. The Rodin Studios open across the street at 200 West 57th Street. The Vanderbilt Gallery is destroyed by a fire that began during the installation of the Architectural League’s 35th Annual Exhibition. The loss of art objects is valued at over $500,000. The AFAS takes out a mortgage to finance the rebuilding and skylight repair, which is completed in January 1921. Fifty-seventh Street is widened to promote commerce. The AFAS removes a stoop with steps and grass plots with granite curbs and replaces the sidewalk. Andrew Carnegie gives the AFAS board a grant to defray from expenses to excavate bedrock to accommodate a new boiler room beneath the street. In addition to its three shareholding organizations, the AFAS building serves as headquarters for the Fine Arts Federation of New York, the Allied Artists of America, the American Water Color Society, the New York Watercolor Club, the National Association of Women Painters and Sculptors, the Society of Mural Painters, and the New York Chapter of the American Institute of Architects. The Architectural League of New York moves out of the building to 115 East 40th Street but retains its shares in the AFAS. The ASL rents its second-floor quarters. A pageant marking the eightieth birthday of Robert W. de Forest, a founder and the fifth president of the Metropolitan Museum of Art, and regarded as “the captain of philanthropy,” is held in the Vanderbilt Gallery. On view in the Vanderbilt Gallery is the National Salon of Photography, an exhibition of 351 prints by amateurs and professionals, that was organized by the Oval Table Society, a proponent of pictorialism. Paul P. Juley of Peter A. Juley & Son, New York City’s oldest art photography studio, moves into offices in the B.F. Goodrich Company Building, at 225 West 57th Street. Juley continues to photograph many ASL instructors and studios in the AFAS. The National Academy of Design vacates its first floor offices in the AFAS and reunites with its schools (then located at Amsterdam Avenue and 109th Street) in a Fifth Avenue townhouse donated by Archer M. Huntington. This move marks the end of forty years of academy annuals, 1901–41, in the AFAS galleries. After its relocation uptown, the National Academy of Design sells its stock to the ASL. The Architectural League of New York follows, selling its stock, making the ASL the sole shareholder in the AFAS. In April, an exhibition of documentary photographs, Heroes and Martyrs of the European Ghettos, sponsored by the Jewish Labor Committee, opens on the second anniversary of the Warsaw Ghetto Uprising. It is one of the last exhibitions held the AFAS first floor galleries before the ASL converts them into studios to accommodate the influx of former G.I.s. Continued overcrowding prompts the ASL’s board to consider a building expansion, and a new fundraising effort is launched. The name “Art Students League of New York” is mounted in brass letters on the AFAS facade over the front entrance. The ornamental ironwork staircase is removed and replaced by two elevators. The partition between Studios 9 and 10 on the fifth floor is removed to create a single studio. 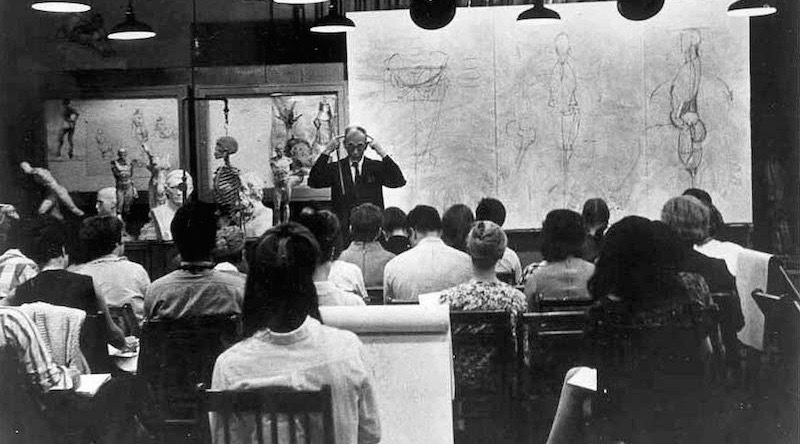 Instructor Frank J. Reilly requests that his large and popular classes be designated a single “unified area” in the AFAS building. The ASL’s board declines the request. Reilly leaves the ASL to establish an eponymous school in Steinway Hall, one block east, at 111 West 57th Street. The AFAS is designated a New York City Landmark. The ASL establishes a new building fund designated for additions, alterations, and renovations. Jie Li, Landmark of ASL, 2017, watercolor on paper, 22 x 30 in. The AFAS is added to the State Register of Historic Places. A small restoration to the building’s two rear entrances on 58th Street is completed. The ASL receives large donations from the Russell and Janet Doubleday Fund and the Gladys & Roland Harriman Foundation for its building fund. The ASL’s summer classes are relocated to studios in Carnegie Hall during an asbestos abatement in the AFAS. The AFAS building is cleared out for an extensive renovation that includes the expansion of the sculpture department in the basement. The AFAS second-floor gallery is officially named the Phyllis Harriman Mason Gallery. The AFAS sells air rights to Extell Development for $23.1 million that enables them to add additional stories to a skyscraper to be constructed on the adjacent lot at 225 West 57th. The AFAS sells additional air rights to Extell Development for $31.8 million, which permits part of the Central Park Tower to cantilever over the AFAS building. The Art Students League celebrates the 125th anniversary of the American Fine Arts Society building. A Landmark Exhibition: An Alliance of Artists and Patrons on 57th Street will be on view in the Phyllis Harriman Mason Gallery from November 7 through December 4, 2017.